Be the first to share your favorite memory, photo or story of Rosalee. This memorial page is dedicated for family, friends and future generations to celebrate the life of their loved one. 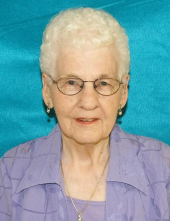 Rosalee Vannaman passed away peacefully into the loving arms of her Lord and Savior on Sunday, March 24, 2019 from a lengthy illness at the age of 89. Rosalee was born on December 7, 1929 to Reverend Marvin Wendel and Rose Emma (Lamb) Williams in Fowler, Kansas, the sixth of nine children. Rosie attended Kiowa, Kansas High School, returning to complete her education and graduate with the class of 1968. On August 26, 1951, she married Cecil Vannaman and they made their home in Kiowa where they raised their four children. Rosie was a member of the Kiowa United Methodist Church from 1945 until her death. She loved to sing and was a faithful member of the KUMC Choir since 1945. Rosie's faith led her to teach Sunday School, Bible School, and junior high and high school youth groups at KUMC. She was a long time member of the United Methodist Women and held many offices for the group. Outside of her church, Rosie led girl and boy scout groups. In addition to teaching children, Rosie was also part of a group that visited the Kiowa nursing home every week for hymns and devotions. She was a member of the VFW Auxiliary and helped at the Kiowa Museum. She portrayed prohibitionist Carrie A. Nation 64 times from 1984-2003 for groups, civic events, and parades. Rosie and Cecil lived in a large home where they enjoyed hosting family meals and get togethers. Rosie was preceded in death by her husband, her parents, brother, Alvin "Bud" and wife, Rosemary Williams, brother, Bobby Williams, sister, May and husband Hiram Johnson, sister, Fae and husband Charles Cline, sister, Joyce Dabbs, brother-in-law, Dean Wirth, her husband's five siblings and their spouses, and one infant great-grandson, Colby McCarthy. She is survived by her children, Linda Holt of Kiowa, KS, Douglas Vannaman and wife Gay of Valley Center, KS, Vicky Purdy and husband Rex of rural Tonkawa, OK, Robbie Vannaman and wife Madi of Lawrence, KS, ten grandchildren and their spouses along with 22 great-grandchildren and one great-great-granddaughter, Hazel Rosalee, expected in July. Survivors also include three sisters, Faeth Wirth of Andover, KS, Bonny Spence of Salida, Colorado, and Cecile Young and husband Carl of Salida, Colorado, as well as numerous cousins, nieces, nephews and many, many friends. A Celebration of Life to remember our beloved Rosie will be held on Friday, April 12, 2019 at 1:00 pm at the Kiowa United Methodist Church in Kiowa, Kansas. She will be laid to rest next to her husband at Kiowa Riverview Cemetery. In lieu of flowers, memorial donations may be made to the Kiowa United Methodist Church, 205 N. 9th Street, Kiowa, KS or to the memorial of your choice. Arrangements are under the direction of Trout Funeral Home & Crematory in Ponca City, Oklahoma. To send flowers or a remembrance gift to the family of Rosalee Vannaman, please visit our Tribute Store. In lieu of flowers, memorial donations may be made in Rosalee's name to the Kiowa First United Methodist Church. "Email Address" would like to share the life celebration of Rosalee Vannaman. Click on the "link" to go to share a favorite memory or leave a condolence message for the family.